To remain healthy, companies have to capitalise as fully as possible on their developments. Take the internal combustion engine, the steering wheel and upholstery. Once these had been invented there wasn't just one way to integrate them, and Ford manufactured the Ka (costing around £7000), the Iacocca Silver 45th Anniversary Edition (around £200,000), and hundreds of variations between. But despite their huge perceived differences, all of these machines move forward and backward, go round corners, and provide seats that allow you to travel around without developing piles. The real differences between them are not so much ones of underlying technology: they are ones of implementation. The situation is no different in the synthesizer world. Take a company such as Arturia. Their engineers developed a very palatable sound generator called TAE ('true analogue emulation') and used it in the creation of all of their V‑series soft synths. It was then inevitable that they would look for new ways to capitalise upon it. But how could they create a second range of TAE‑based products without stepping on their own toes? 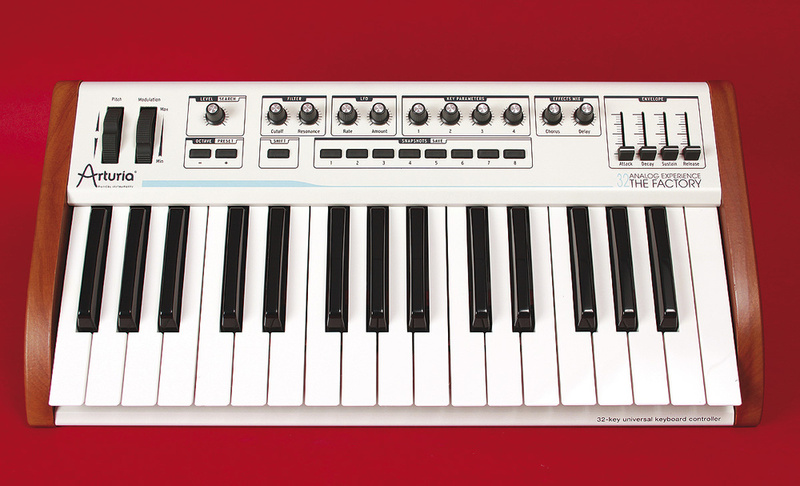 The Analog Factory (Sound On Sound, January 2007) was Arturia's first divergent use of TAE. Designed to make sound selection from a patch library of presets as painless as possible, its GUI combined a 32‑note 'virtual' keyboard, a limited amount of editing, and eight snapshot buttons that allowed users to store eight configurations (ie. the choice of the initial patch plus the positions of all the edit controls) for quick recall of tweaked sounds. Fortunately, this was not the limit of the storage available, and modified patches could be stored as new presets in their own right. A few generations later (see box), the Analog Factory has evolved into three products that combine a huge library of initial sounds, limited editing, and a dedicated, physical keyboard optimised for each. These share their underlying technology, but offer a range of facilities and price points designed to suit a wider range of needs and pockets than before. Marketed under the umbrella of the Analog Experience, these are The Player, The Factory, and The Laboratory, the last of which is due for release in 2011. Installing the software for both The Player and The Factory proved to be straightforward and, although I have a Steinberg eLicenser dongle, I used the 'soft' on‑line authorisation process, which proved to be painless. I then plugged their two, dedicated USB keyboards into my Mac, discovered that this was adequate to power them (although conventional 12VDC power inputs are provided for times when you might want to use either keyboard separate from a computer) and double‑clicked to load the stand‑alone versions of each package. Both initialised without hesitation, synchronised with their own keyboards, and I was ready to go. 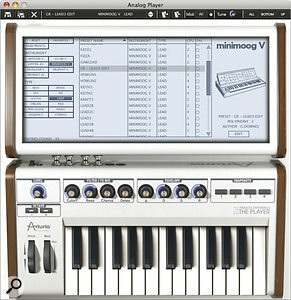 The Player is the smallest and cheapest of the three new products, with a 25‑note velocity‑sensitive keyboard, 1000 of the patches from the fully fledged library of 3500, and a sparse set of editing parameters. When using the on‑screen GUI, four knobs provide control over filter cutoff frequency and resonance, as well as the wet/dry mix of the basic chorus and delay effects (the latter of which is MIDI sync'ed when appropriate), while four more control an ADSR contour generator for the audio amplifier. A ninth knob controls the overall level. All the knobs have collars that show the approximate parameter values, as well as tooltips that contain the precise ones. In addition to these knobs, octave up/down buttons provide ±3 octaves of pitch‑shift, there are four buttons for saving and recalling snapshots, and the usual pitch‑bend and modulation wheels complete the package. I began by working my way through the patch library. You can sort the contents by name, instrument, sound type, and even the CPU load(! ), but the patch selection mechanism also allows you to specify what you're looking for in terms of two filters: the synth engine on which it was created (Minimoog V, ARP 2600V, and so on) and the nature of the sound that you want (bass, lead, piano, and so on). 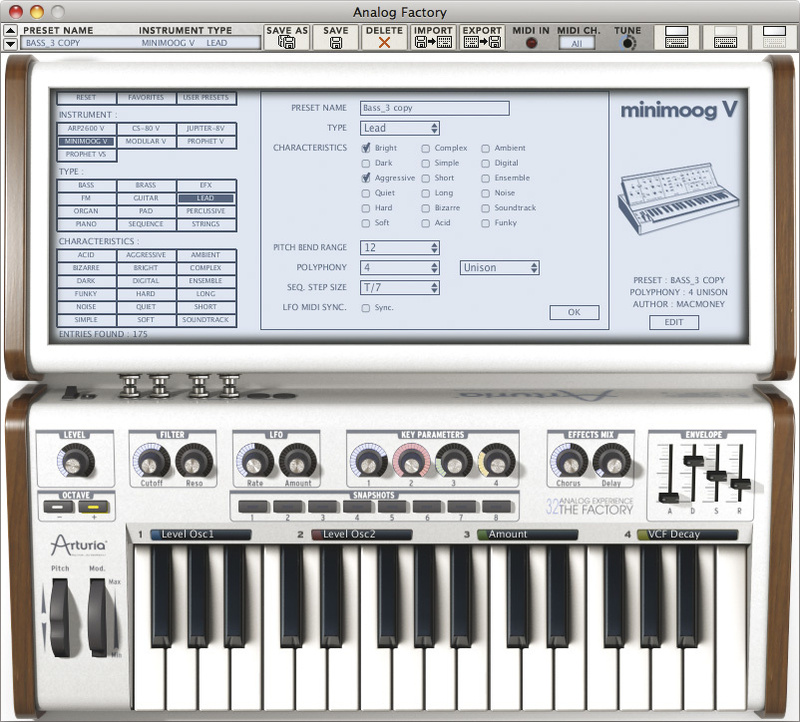 I selected 'Minimoog V' as the instrument and 'Lead' as the type. This presented me with a list of 34 patches, some of which I would be happy to use unmolested. Others, I was happier to tweak. For example, I took 'Lead3', reduced the filter cutoff frequency, increased the resonance, extended the release and removed the delay effect to create another recognisable Minimoog sound. I decided to save this, and in the Save As page I discovered five additional parameters: the pitch‑bend range, the polyphony (one to 32 notes), mono, poly or unison modes, LFO MIDI Sync on/off, and a thing called Sequencer Step Size, which determines how parameters such as the clock in ARP 2600V patches and the speeds of the Minimoog V and CS80V arpeggiators are synchronised. There's also a field called 'Characteristics', but this is only relevant within The Factory's patch selection mechanism, and in my view this should have been removed from The Player's interface. I named and saved my edited patch, whereupon the GUI told me that I now had 35 Minimoog lead patches at my disposal. Unfortunately, Geoff Downes (who wrote the original patch) was still taking credit for my new, improved version, and the Preset description on the right of the screen was still telling me that the polyphony was one, even thought I had increased it to two. While not serious, these are bugs to be eliminated as soon as possible. Hours — or even days — later, having enjoyed and mangled all manner of pads, basses, organs, weird effects and more, I paid a visit to The Player's CS80 brass sounds. There are 13 of these, but I must admit that I was marginally disappointed with them. Nowhere was the 'Fat Greek sound' recreated, so I tried to create my own... and failed. This was because The Player offers no control over the filter envelope. Nonetheless, I came up with some pleasing sounds, so I decided to save them. In doing so, I found that the Polyphony and mode fields in the Save As page were empty, and clicking on them revealed the faint message, 'No choices'. What was going on? I contacted Arturia, but they didn't know either. It seems to be a bug, and they promised to address it. It's straightforward to use The Player with the MIDI controller of your choice because you can Command-click (or, on a PC, Ctrl-click) to reveal the MIDI CC number assigned to each control and then reassign it. Nevertheless, you're more likely to use it with its own keyboard, which duplicates the function, although not the precise form of the GUI. Happily, the differences are of no great consequence and, despite the keyboard's diminutive size and limited functionality, I must admit that I rather liked it. The semi‑weighted keys are surprisingly playable, and there's even an input for a sustain pedal. The hardware seems robust, but it's light enough to go in your backpack and small enough to sit on a tray table while on your way to somewhere warm and pleasant. 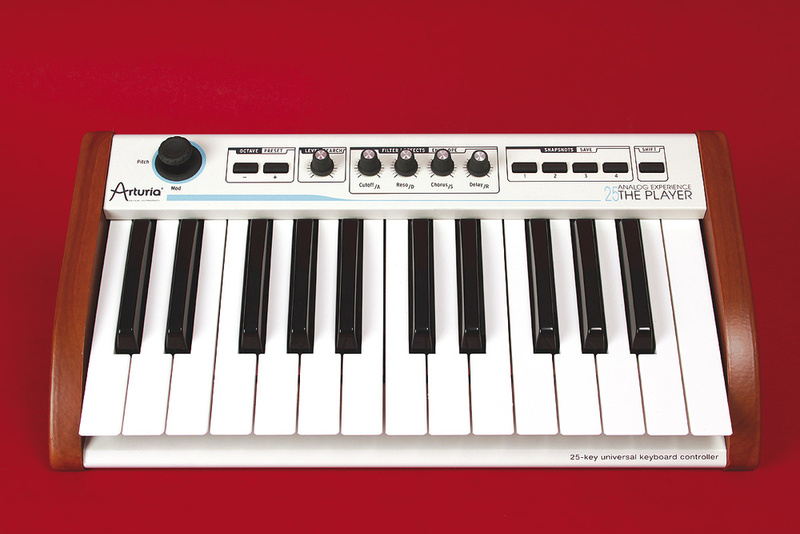 What's more, there's a five‑pin MIDI Out, so you can use it as a generic controller keyboard. I tried this with a number of synths — an Alpha Juno 2 and a Yamaha DX100 as well as a selection of other soft synths — and it always behaved as it should. Oh yes... and you can use it as a USB/MIDI converter, directing USB‑borne MIDI from the computer to synths and modules boasting five‑pin MIDI interfaces. This is a real bonus. 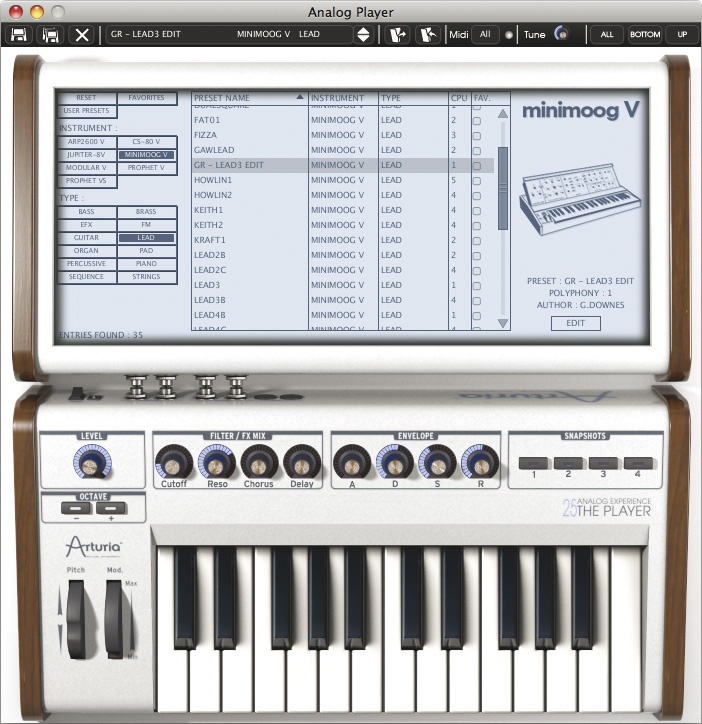 The Player's 25‑note keyboard and its controls are echoed in the on‑screen version, but with extra knobs rather than shifted functions. A level up from The Player, The Factory provides the full library of 3500 presets, comes with a 32‑note velocity‑ and aftertouch‑sensitive keyboard that provides an additional expression pedal input, has an improved GUI and toolbar, and offers a wider range of editing capabilities. The extensions are not trivial. There are now knobs for the LFO speed and depth, independent sliders for the ADSR contour, eight snapshot buttons rather than four, and — most significantly — four knobs labelled 'Key Parameters' that bring four additional parameters to the fore on a patch‑by‑patch basis. So, for example, The Factory's version of 'Kraft1' provides control over the Osc1 Level, the Osc3 Width (so I assume that it's a pulse wave), Amount (amount of what? ), and the VCF Decay. These descriptions appear when you click on the on‑screen representation of each knob but — as you can see — they are not always explicit, so there's some additional work needed here. Happily, there's an option tucked away in the Preferences that allows you to display in little windows the identities of each of the Key Parameters, which is a huge boon and stops you flying blind when editing from the keyboard. Nonetheless, because the underlying patch isn't visible, there were times when I turned a knob expecting one thing to happen and something different occurred. 'Kraft1' remains a case in point: twiddle a few knobs and you can end up with an out‑of‑tune sound a couple of octaves higher than the original patch. This is because the LFO Amount parameter appears to be hooked up to a pitch CV. Similar, seemingly anomalous (but actually correct) behaviour is echoed in other patches, so beware gremlins if you're going to try to design sounds rather than just twiddling and hoping. Nonetheless, the benefits of the extra programming capabilities can't be overstated. When I turned again to the CS80 brass presets, it was straightforward to create the Blade Runner patches that I wanted. Of course, you may have no desire to create Mr P's brass sounds, but the principle holds: whether your tastes lie in the 1970s, '80s, '90s, or the 21st century, The Factory is much more likely to be able to provide what you need. Then, when you come to save your new patches, they benefit from the aforementioned Characteristics. This offers choices including Acid, Bizarre and Complex, as well as more quotidian descriptions such as Simple, Short and Soft. There are 18 Characteristics in all, and you can assign any combination to aid patch selection. Having said that, it would have been nice to be able to add new Characteristics since the existing ones didn't always satisfy my needs. There are many good things to report about The Player and The Factory. For example, Snapshots are saved when you close the software and then recalled when you reopen it, so they make setup for live performance much simpler than it would otherwise be, and the fact that you can select them from the keyboards without turning to the computer is doubly beneficial. What's more, the concept of filtering preset selection according to Instrument, Type and, in the case of The Factory, Characteristics is not to be dismissed lightly. Indeed, there's even a third (or, on The Factory) fourth criterion — Favourite or User Preset — that allows you to home in on a smaller subset from the library, and this speeds things up still further. When using the VST and AU versions of either package you can launch multiple instances simultaneously and, as well as using these multitimbrally, you can of course build huge polytimbral patches from them. Three layers of Prophet, Jupiter and (quasi‑) Memorymoog strings in an ensemble, ma'am? Coming right up! What's more, you can use the MIDI Control Center software (see box) to set the parameters on each instance to respond to a separate MIDI CC number, which means that you can retain individual control over each patch. It was while experimenting with this that I also discovered that new sounds that I created within the VST and AU versions of either package became available in the stand‑alone version, and vice versa. This is also good news. But most important of all, both of these packages can sound excellent. I didn't bother to dig out my Minimoog, Prophet et al to check whether their patches are identical with those of the originals, but the provenance is sometimes clearly audible and, given the purposes for which The Player and The Factory are designed, that's good enough for me. Of course, not everything is hunky dory. For example, while The Player's keyboard performed its USB/MIDI duties flawlessly, The Factory's didn't perform them at all. I contacted Arturia about this, and it seems that it might be a firmware fault so, at the time of writing, they are looking into it. I also noticed that the polarity of the sustain pedals for the two packages is different: the 32 is — correctly — 'push to make', while the 25 is 'push to break'. Why? I haven't a clue, but it was true over MIDI as well as for the packages' own sounds. It's also worth noting that the bugs that I uncovered in The Player were also present in The Factory, and in both cases I found the manual rather too sketchy, especially given the target audience for these products. For example, what's an expression pedal and how do you use it? The manual for The Factory doesn't tell you, it simply says that you can plug one in. It's not until you realise that you have to set up one of the available knobs or sliders to respond to MIDI CC 11 that you can get the pedal to do anything, and it's unlikely that a novice will stumble upon by this accident. Sonically, the only problem that I encountered was that Unison does little more than make sounds louder and, on occasion, slightly 'flangy'. This is because there is no associated unison detune; something that could be added behind the scenes if Arturia didn't want to make it an editable parameter. Finally, it's only fair to report that I experienced very occasional crashes with both packages by the end of the review, but I suspect that these didn't start to occur until after I had mixed and matched the software packages and keyboards (see box) to the point where my poor old Mac must have been thoroughly discombobulated, so I bear neither the software nor Arturia any malice for this. The Factory's extended editing and preset selection capabilities are immediately visible. Note the readouts immediately above the keyboard that show which parameters are assigned to the Key Parameter knobs. 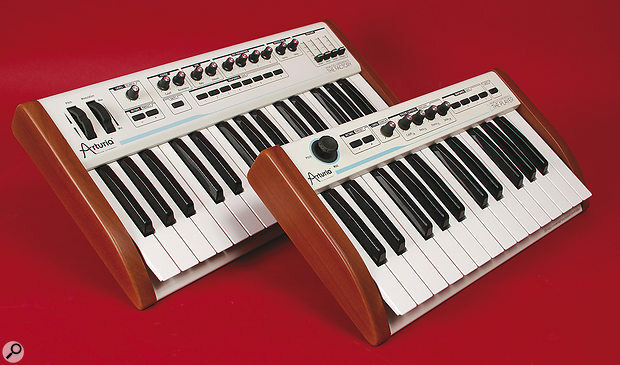 Let's be clear, these are no über‑synths that allow you to create outrageous, never‑heard‑before sounds. Nonetheless, while their 'tweakable preset' architecture might seem a bit limiting, it has many precedents, including many early FM instruments and analogue synths such as the ARP ProSoloist — some of which still rate among the most useful keyboards ever developed. Indeed, Tony Banks of Genesis once confided to me that he used the ProSoloist precisely because it gave him instant access to a palette of high‑quality, tweakable preset sounds without having to worry about the complexities of their synthesis. Now, nearly 40 years later, the major selling point of The Analog Experience is that it provides near‑instant access to a palette of high‑quality, tweakable preset sounds, making them accessible to players who have no wish to worry about the complexities of their synthesis. So, while you and I may enjoy nothing more than making our synths recreate the sounds of bovine‑generated methane discharges, many users in fields such as film soundtrack composition have neither the time nor the inclination to source an appropriate instrument and then program it to do so. For people like this, being able to tweak an existing preset in an affordable package may be an ideal solution both in terms of speed and cost. The only previous soft synth supplied with a dedicated keyboard was, as far as I am aware, the original version of Korg's Legacy Collection, but this is long since discontinued. The only other soft synth that concentrates on its patch library and a speedy selection mechanism rather than in‑depth programming is... um, well, I can't think of one. Unless my memory is going the same way as my hair (ie. absent without leave) the Analog Experience is a currently a unique product concept. I wondered whether The Player could work with The Factory's keyboard and vice‑versa, so I loaded both the VST and AU versions of The Factory into Plogue Bidule and connected The Player's 25‑note keyboard. Would it work correctly? Yes, it would. Could I edit The Factory with The Player's keyboard? Yes, I could. I then swapped software and keyboards. Could I play The Player using The Factory's 32‑note keyboard? Yes, I could. Could I edit The Player using The Factory's keyboard? Yes, I could. And did the enhanced control set on The Factory's keyboard give me access to additional editing parameters not present on The Player's GUI or 25‑note keyboard? No, it didn't, and quite right too! Finally, I connected both keyboards simultaneously and routed one to a combination of The Player and The Factory, and the second keyboard to a second combination. Again, everything worked faultlessly. There was no clash of identities, and simultaneous editing was possible on both setups. 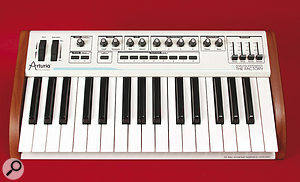 The original Analog Factory (2006) eschewed the detailed editing of conventional soft synths and placed 2000 patches derived from Arturia's V‑series soft synths into a simplified user‑interface that allowed players to choose patches and tweak them using a subset of their parameters. 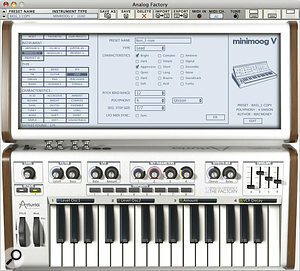 Reviewers praised its lead and bass patches, its strings, pads and brasses, and even found uses for its ambient sounds and effects. At around £150$250, the Analog Factory proved to be an interesting compromise between performance, simplicity and price, but it was soon superseded by the Analog Factory Reloaded, which offered an additional 1000 presets. This was in turn superseded by Analog Factory 2.0, which was later renamed Analog Factory Experience. This added a further 500 patches (including, for the first time, some from the Jupiter 8V) plus a physical, 32‑note keyboard controller manufactured for Arturia by CME. The next stage was for the Analog Factory Experience to metamorphose into Analog Experience The Factory. 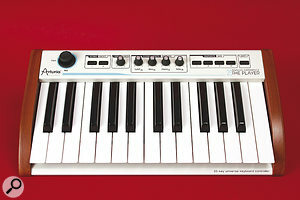 This added pressure sensitivity to the package, and allowed Arturia to position it in the middle of the three new Analog Experience products: The Player, The Factory, and The Laboratory. Although the keyboards supplied with the Analog Player and Analog Factory synchronise automatically with their respective software packages, there are times when you may want to reconfigure which MIDI CC number is sent by which knob, button, wheel, joystick or control input. Doing so couldn't be simpler; just launch the MIDI Control Center, click on the control that you want to edit, and then select the CC number from the list. Once you've configured everything to taste, you can send the results to the keyboard itself, which will remember them until you invoke the software again to change things. Simple to install, initialise and use. The Factory is an excellent compromise between simplicity and flexibility. The Player may be a bit limited for some potential users. There are still bugs and inconsistencies to be zapped. Given the target users, the manual is a little sketchy in places. There's a place in the world for humongous modular synths that take a decade or two to figure out, and another for equally humongous synthesizer workstations that nobody will ever fathom fully. There's yet another for simple synthesizers that offer many of the sounds of their more complex inspirations, but contained within packages that make sound selection and editing far quicker and simpler than elsewhere, although at the expense of detailed editing capabilities. The Arturia Analog Experience provides three flavours of high‑quality simplicity and, in particular, The Factory appears to offer an excellent compromise between price, ease of use, usability and flexibility. The Player €149; The Factory €229. Prices include VAT. The Player $169.99, The Experience $299.99. Apple MacBook Pro with 2.6GHz Intel Core 2 Duo CPU and 4GB RAM, running OS 10.6.4.